The Content Collection Pack for MW3 is here! If you don't Have a premium membership for Call of Duty Elite, today is your first chance to check out the new content with Collection 1. For 1200 MSP ($15), you'll have access to six pieces of content, four multiplayer maps and two special ops missions. The Spec Ops maps contain new achievements to unlock. One you download the 108 KB file from the Xbox Live marketplace, you'll need to go into the game's store and begin your download of the maps. "If you are a Call of Duty Elite premium member, you already have access to the content in this Content Collection. Modern Warfare® 3’s first downloadable “Collection” arrives stockpiled with not only four Multiplayer/Survival Mode Maps, but two Special Ops Missions—the first time Call of Duty® has ever made Special Ops downloadable online. Armed with just this one content pack, players can choose between heading to a militarized Central Park in “Liberation,” destroying scenic vistas in a seaside Italian getaway in “Piazza,” raining glass on New York passersby from 70-stories-up in “Overwatch,” and battling beside a downed Air Force One in “Black Box.” As if that breadth of multiplayer variety wasn’t enough, fans of Special Ops can hop aboard snowmobiles to infiltrate a diamond mine in “”Black Ice” or head to India, where “Negotiator” will leave the fate of hostages in their hands. 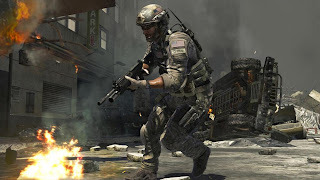 In a class of its own with half-a-dozen forms of content, Modern Warfare® 3’s first downloadable “Collection” offers a range of combat and co-op the likes of which has never been seen before. After this download is complete, please download the accompanying Collection 1 maps from the in-game STORE option in the MULTIPLAYER menu."